Had this shipped from a lady in colorado! Picked up the Projector and Camera for a reasonable price. I've been wanting something with variable speeds so I can do my own transfers at home. 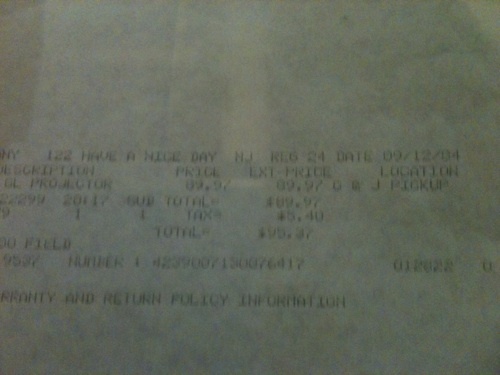 Came with the Original Box, Receipt, and manual! A whopping $94 in 1984! Chinon made some of the last projectors for all the following manufacturers: Bell & Howell ,Gaf, Keystone, Hanilux, Sears. 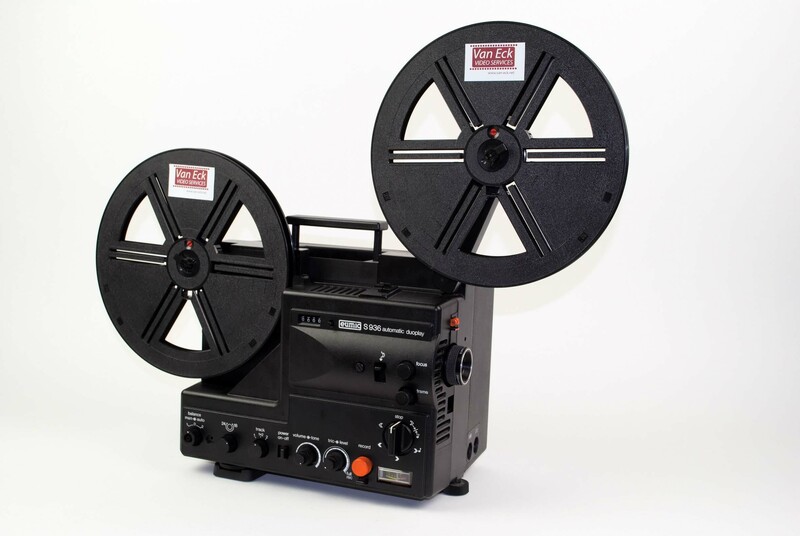 These are some of the best projectors for film transfers ever made that are still affordable. The models are ascending in options 727 Whisper, 2000gl, 2500gl, 3000GL,, 4000GL. Negatives: impossible to find some power cords and must be custom made. Major Negatives: They have a plastic gate assy (this is where the film goes through the lens area. This I am seeing more and more warped gates. A warped gate makes this useless. The odd thing is with a warped gate it will play Super 8mm and NON-HOME 8mm movies for the most part no problem but will shred you 8mm home movies in a heartbeat. I have this experience when I received a VS film (wraped film) which was unstable in my Elmo but play fine in Chinon. So I keep my Chinon aslo for this purpose. BTW, how much did you pay for this Kirk? Thanks for the Link Barry! 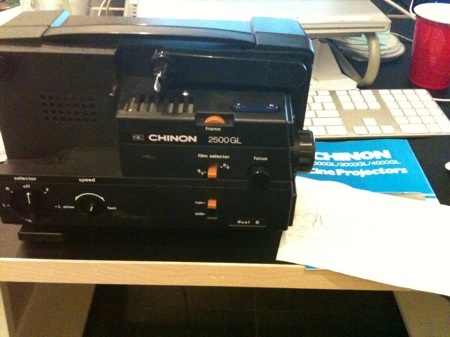 Funny that at the moment my workhorse projector is a Chinon 330mv for sound and now I'll use this one for transfers. I'm hoping to get a decent EUMIG someday, but for now these 2 will have to do. I've been careful and haven't had any issues with my 330 yet. I doubt this new machine will get very much use. Only to do quick transfers of my personal super8 movies that I continue to shoot in the summers! EDIT- I got the projector for $40. Which is fair considering what I was really after was the Chinon 132PXL camera she threw in for free. The camera is a cheapo fixed focus unit, but it shoots 100d like a champ and I can hand it to any friend and they're not intimidated. I wanted a back-up in case mine ever dies and now I have one! This means however I'm going to put up that Sankyo 500 for $60 on craigslist. Never figured out the revving problem... I need to follow up on that post soon. However it works fine once it gets going! That was a real bargain at that price! I'd add that I have not heard of that gate issue from any user on any forums I visit regarding film and projectors. I only mentioned it because if I didn't and then heard someone ruined a precious home movie, I would feel like crap not having brought it up. Easy enough to test if you have some leader or old junk home shot 8mm. I use Sankyo Dualux 2000H for my transfers and like it a lot. Uses pinch rollers not sprockets and is very kind to film. Kirk, Austin is looking for a bagain projector. He may buy your Sankyo. I just picked up a Chinon 2500GL at an estate sale for $30.00. They let me test it at the sale and the person that owned it said they only used it about 3 times. It looks brand new and seems to run great. The belt was slipping a little but seems to work fine after I cleaned it and the pulleys. I looked at the film gate and it looks to me like it's made of metal, not plastic like the article posted by Barry. Did they make different versions of this or am I missing something? The film gate is kind of difficult to get at for cleaning and doesn't open very wide. On both transfers I used a circular polarizing filter on the camera and that seemed to make a lot of the flicker go away. Great deal Bryan. I had one of those. Great little projector. My comments are intended for the novice looking for an 8mm projector for film conversion work. I know this is quite an old thread, but I wanted to chime in on the quote offered earlier from the potentially dubious article written by the projector restoration guy on Ebay. Specifically, the article states that Chinon projectors and their plastic film gates that can warp and destroy R8 films. He made Chinons sound like bombs waiting to go off, and he also made "anything by Elmo" sound as if they can do no wrong. Both are quite inaccurate, but it still has yet to be corrected. Being firmly aware of the Elmo brand in all its glory and yet purchasing a Chinon anyway, I wanted to explain why I did so and also correct a few misconceptions that guy creates in his article. For my own purposes, my large archive of cherished family movies that span back to 1941 are worth more than anything else I own. I wont trust these movies to projectors with known issues or bad reputations, even though I do understand that nothing is truly perfect. But some do get closer to perfect than others. Contrary to that guy's article, I didn't buy an Elmo. I'm not saying Elmos are bad, I know they're great, and I have no interest in offending those who own and love them. I'll probably buy one eventually for fun. But not for conversion work. More on that in a second. I just wanted to offer that though some Chinons may have plastic film gates (according to that guy), my 4000GL does not - it's very clearly a METAL film gate, and the thing looks and runs as smooth as glass like it was manufactured last week (it's 37 years old). As for the conversion process itself using the 4000GL, I just pre-clean the films before I play them (a very gentle dust removal with microfiber cloth during a FF/REW run) and a quick compressed air blowout of the projector's light and film path between the showing of each reel. The 4000GL has the ability to expose pretty much everything to nozzled computer DustOff cannisters for cleaning, as all the main parts inside that can gather dust (in the film and light path) all have hinges that allow them to be opened, turned, pivoted, exposed, etc without any disassembly other than the main cover that is held in by one screw. The conversion results so far (capturing at 1080/60p with a Panasonic HC-V770) are stunning. For anybody out there needing to do conversion work, I highly recommend the Chinon 4000GL, which just like the Elmos, is a brand that is well-respected for this work. So why did I not go with an Elmo like that guy states in his article? After MUCH research, including many notable articles and comments on this forum, I specifically went Chinon instead of Elmo due to what seems to be a universally acknowledged fact that Elmos are notorious for scratching film, which is unacceptable for irreplaceable family history films. It's not that Elmos are the only projectors that may do this, I noted that Elmos specifically are regularly singled out and criticized for this. As for nostalgic projection of my movies on a silver screen, if I ever want to play the movies just to see them in their original format, I also purchased a pristine Eumig Marks S810 D Lux with spare belts and bulbs, even though I don't have any 8mm film with audio. Research also suggests that the Eumigs are a very high-quality, well-respected and sought-after brand that are known to never scratch film and have incredible optics (just wish Eumigs had variable speed dials, doggone it). As you can see, my main focus in a projector is its care and preservation of the film itself with all other bells and whistles being secondary to that, be it for transfer/conversion work or just nostalgic playback. Anyway, I hope this didn't come off as a rant, it was just meant as a "corrective offering" to anybody that might be looking for a projector that's excellent for transfer/conversion work but might come across that guy's misleading and incomplete article on Ebay. Bob, the Eumig 900 series do in fact have precision variable speed mechanical drives which can be adjusted during projection. The 800 series have a less developed mechanical speed drive which cannot be adjusted during projection. Both the 800's and 900's are high quality machines which will not scratch film. Sound quality is vastly superior on the 900's and the 938 is the one to get if you ever decide to purchase a Eumig. Eumig 900 series, you say? Now how on earth did that get past me? Here's a lower priced model in the Eumig 900 series, the S936. The variable speed control is the second control on the left. Why we need a projector for transferring film when a film scanner has now gone to around $350? It did make a sense a long time ago when the scanner was around $2000. Winbert... Quality of image and reliability will have to be improved before these new cheap scanners can be a good replacement for DIY projector based telecine. However the technology is heading in the right direction. Excellent point! I actually have looked into the Wolverine units, which are WONDERFUL to get the job done for the average novice I suppose, but but I was not happy with the output formats of 720 resolution and limited MP4 video. I was surprised about the low quality of the output, especially for precious and irreplaceable memories. It's very important to understand that the chemical-based resolution of that old 8mm film is still MUCH higher than most would assume, and definitely requires a bare minimum of 1080p digital conversion. And that's after getting a good transfer process set up properly, which I believe takes a good projector/screen/camcorder setup. After getting everything transferred to an acceptable 1080p format (which I'm in the middle of just to rescue the films), I'll then convert the 8mm again onto 4K when computers catch up to being able to process 4k video files without requiring a server farm to keep from choking on those huge files. My transfers are 1080/60p with 5.1 surround, even though it's only capturing the sound of the projector and reels for nostalgia's sake (I seek to preserve that too). I may ultimately go the scan route in the future if I can find something in 4K that is also affordable, but for now I'm out to ensure a great transfer to ensure the films are preserved on bluray at a reasonable price. Also very important to understand: Hard drives, SD cards, CDROM, DVD, and USB sticks are NOT long-term storage devices for media or data. It MUST be BluRay - no other storage medium available today was designed for long-term storage, despite what manufacturers originally said on format introduction. USB sticks go bad relatively quickly, even faster in a hot car. Hard drives fail in many different unrecoverable ways. SD cards are just flat USB sticks. CD and DVD succumb to bacterial/fungal decay and delamination (layer edges are not sealed, an EPIC blunder of design that took 10 years to discover). Don't even think about tape of any kind. BluRay (sealed edges) is currently all there is for long-term media/data storage. Was reading up on all the available film scanners, such as the Wolverine, Reflecta, Winat units. Guess what: They're aALL built by Winait (China), which is why they all have the same poor quality, output, reliability, and support failures. In short, it's all just a bunch of junk, including the $1,200 Reflecta scanner. So far, nothing is beating the projector/camcorder combo for reliability, quality, and speed of conversion, not to mention my Chinon 4000GL behaving like it's a 5-gate (no flicker onto video whatsoever). Only issue I have to deal with is manually adjusting for very slight focus drift during transfer, which is still FAR better than the low-res results of these cheapo film scanners. The scanners are improving, but still have a LONG way to go. Thank you for the post. I know that Chinon's tend to get a bad rap in some circles, but I've had very good luck with mine. I appreciate your comment about cleaning one's films before running. I do the same and I'm also meticulous about keeping my film gates cleaned on my projectors.